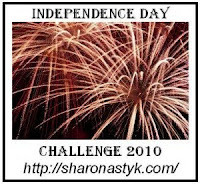 Every week I try to link back to Sharon Astyk's blog, and her latest post on the progress of the Independence Day Challenge. 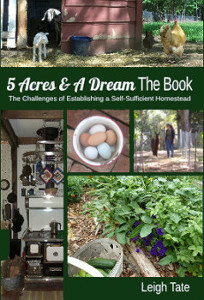 I have been meaning to mention, that both Alison (Yarn In My Pocket ) and Geodyne (Steps Toward Self Sufficiency) have been participating with a slightly different focus, sustainability. In some ways I think this whole exercise lends itself very well to sustainability, i.e. working toward being able to make what one needs with what one has available. Seed saving is an example. On the other hand, I realize that not everyone lives where this is possible, nor does everyone wish to do it. Still, I think being prepared for an emergency, and being able to provide some things for oneself is wise. The goal with this challenge isn't to burden oneself with a huge project, but rather to work a little at a time toward that sense of accomplishment, self-sufficiency, and independence. the usual: line drying clothes, dumping cooled canning water on plants, recycling all our plastics, metal cans, cardboard, & glass, giving weeds & kitchen scraps to the chickens and goats, etc. I found half-gallon wide-mouth canning jars at a grocery store and bought a dozen. Since the USDA doesn't recommend canning in them, I didn't think they were made any more. Back in the day, we actually did use them for canning, but I doubt one could find processing times for half-gallons now. At any rate, half-gallon quantities would too big for Dan and me, but they are perfect for yogurt making, storing whey from yogurt cheese, storing dried goods, etc., and, I'm thinking they'll be perfect for milk once we start milking. 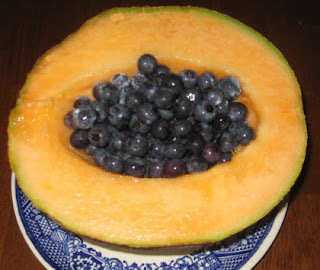 I don't can pie fillings, but prefer just to freeze the fruit and use it to make a pie filling from scratch. I had to look up "clear gel" as I'd never heard of it. It's modified corn starch, so I guess it's not that bad, since I use regular cornstarch in a filling which might need thickening. However, I'd have to wonder in which way it's modified and what it really does to the product. I always go for less processed products. Beans - some in the freezer and all the roos are in the freezer too! Wow, is it ever quiet around here now. Very nice that you are able to make your sauce from your garden! You do so many things! I am working on a goal of freezing as many bags of green beans as I can. that seems to keep me busy enough. We've been having so much rain though that they may get moldy. We have planted at different times so counting on those later pickings. Blueberry picking here starts this coming week, time to plug the big freezer back in! I don't know about clear gel either. Is it from non gmo corn? Can it be used in jams & jellies too? I'll have to check it out. right now? gooseberries, gooseberries ... and more gooseberries:)) I wish they were blueberries instead! but at least I can proclaim to have eaten the first three cherry toms of our own:)) back to picking... more gooseberries of course! (why are they called that - do geese like them?? What are you going to do with the corn silks?! Are they for crafting? Or eating? At the moment, I am mainly getting green (and yellow) beans from the garden, and some tomatoes, and a little basil. Everything else is coming along though, thank goodness. Leigh, do you dry vegetables? And if so, how do you cook with them? I am just beginning to think about dehydrating. I'm curious about what you do with the corn silk- for human consumption, or livestock, or...?? Nina, my original plan was to make pie fillings from my frozen berries, like you. But I have wanted to have some "convenience" foods on hand, like frozen homemade meals, and pie filling. When I researched recipes for canning, experienced canners preferred the clear jel because the filling doen't separate after processing, as it does with regular cornstarch, although those who can pie filling with corn starch simply say to give it a sir before using. I can appreciate the post-rooster quite. We still have 3 roos and they still make too much racket! That will be tended to directly however. Michelle, we could definitely use some of your rain! Clear jel is precooked cornstarch. IOW, regular cornstarch may be considered "raw," and clear jel "cooked." The advantage of this (or so I read) is that one can mix it with hot liquid, unlike regular cornstarch, which will lump unless mixed with cold liquid. As far as GMO or non-GMO, I doubt it's non-GMO because so few commercial products with corn are non-GMO. It's difficult to find non-GMO cornstarch too, especially since manufacturers are strongly discouraged from informing the consumer about this. Maggie and Sue, I use the corn silk as a medicinal herb. It is a diuretic and demulcent, which means it is soothing to mucous membranes. It's a useful herb for anything having to do with the urinary tract, so I use it in my urinary tincture, and also in Dan's male formula, which contains herbs to promote prostate health. Cynthia, I dry some vegetables and some fruits. Last year I dehydrated green beans and summer squash, but honestly, we didn't care for them a whole lot. I found the green beans re1quired first being put in boiling water and left to soak overnight. Then they still required a long time to cook till tender. I think they would be well suited for long simmering soups and stews. Same with the squash. Ours was tough, but perhaps I didn't leave it soak long enough. We do like dehydrated onions and mushrooms. Also tomatoes dry well. My blueberries from last year were too hard. It may have been the blueberries or it may have been me. I'm trying an experiment on that and will report soon. I also thought the figs dried really well. Easy to reconstitute and tasty in fig cake. I think dehydrating foods is definitely worth looking in to. You will probably find you like it better for some things than others. I think it is personal preference in many cases. I don't use any cornstarch because it is made from GMO corn. Instead I substitute arrowroot powder and haven't found anything that it doesn't work in. 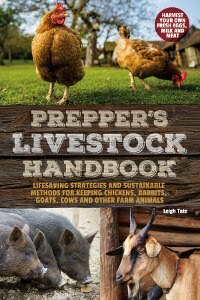 Leigh, I admire you so much for setting down in black and white all the things you do to work toward better living and more sustainably. Perhaps we do more than I think but you set a good example for us by spelling it all out. Mama Pea, I'm curious, have you ever tried to can pie fillings with arrowroot?? When I make pies from scratch, I use unbleached flour for my thickener. In my research though, I learned that most thickeners don't stand up well to the processing needed to can certain foods. It is possible to find non-GMO cornstarch. I can't remember the brand. I found it at a discount store and loaded up. I rarely use cornstarch anymore. I think you're right that we don't realize how much we actually do toward sustainability. Some days I feel like I'm busy all day long but when I tell my DH what I did, it's seems like so little compared to all the time it took. That's where this challenge has been helpful. By writing it all down, I can look back over the week and feel like I really did accomplish something. I've never even canned pie fillings before (!) but have now been tempted by your tales of doing same. So I can't say whether the arrowroot powder would work for sure under those conditions. Sounds like we need to experiment! I agree and I'd love to compare notes. I'm interested in some convenient type foods and this seemed like a good place to start! 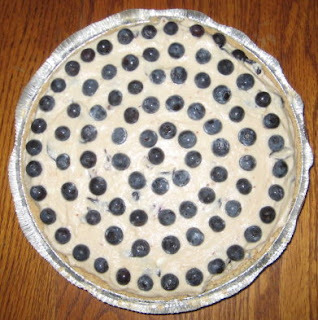 I recently found a website on Starch Thickeners as I was trying to find out if I could can pie filling made with tapioca flour, of which I have (organic to boot). They didn't mention if I could, but still, it looks like a good resource. There are a lot of blueberries in that list!